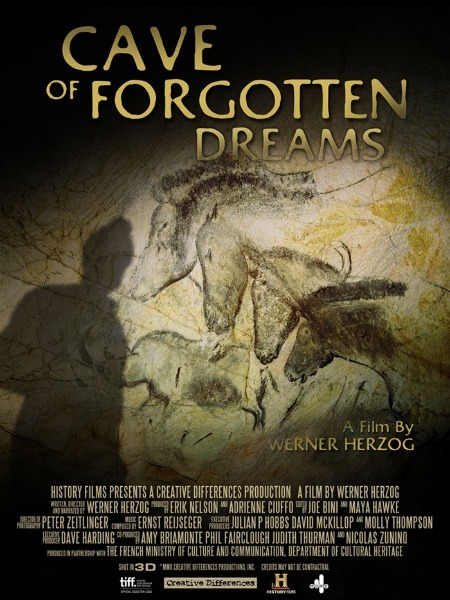 Werner Herzog‘s 2010 film, Cave of Forgotten Dreams, shows masterful cave drawings done by ancestors 25,000 to 32,000 years ago. The drawings were found in 1994 in Chauvet Cave in the south of France. Herzog is our film guide, but towards the end of the story he allows us some time alone to simply observe those beautiful drawings. The film is in 3-D, which is perfect for viewing the uneven surfaces of the cave wall. John Stuart Curry is a relative of my daughter-in-law’s, thus my grandchildren. Curry was born in northeast Kansas in 1897. He died in 1946. In 1941 he completed a powerful mural, John Brown, which is in the Kansas Capital building in Topeka. This photo was taken at the new deYoung Museum of Art in San Francisco. An architectural wonder, it holds a fantastic American art collection. The interior space flows nicely too. If you visit, when walking through the sculpture garden, follow the path through to the end. You’ll enter a round building where sound changes as you walk through it. You have to provide the sound. Be sure to stand in the very center of the room. What a treat to visit with my parents’ friends and to see my godmother, Emma Jo. Ever supportive, she said, although she still drives, that she would have crawled to get to this show. Boy do I feel loved! My brother, Brent, and both of my sisters, Sue and Deana, worked to make my visit and the reception perfect. Sue, who owns an event decorating business, Dream Makers, is superb at creating something special and she did it for me. As a kid, Alicia was my hip friend from the city, who visited her grandmother and cousin in Pal during the summers. Alone, I never would have listened so carefully to “Louie, Louie”. She is a patron and a dear. Virginia, Lavina and Alma are old family friends. Others in these pictures I’ve known forever. Betty, whom I hadn’t seen for 39 years, drove in from St Louis with pictures of us from 1970. Fun. So many folks who helped with this exhibit are deserving of thanks. I am grateful to them and to everyone who took the time to attend the reception. Those who plan to visit the exhibit sometime during the summer are also appreciated. There’s a long list of folks, including my family, who put effort into making this show happen. 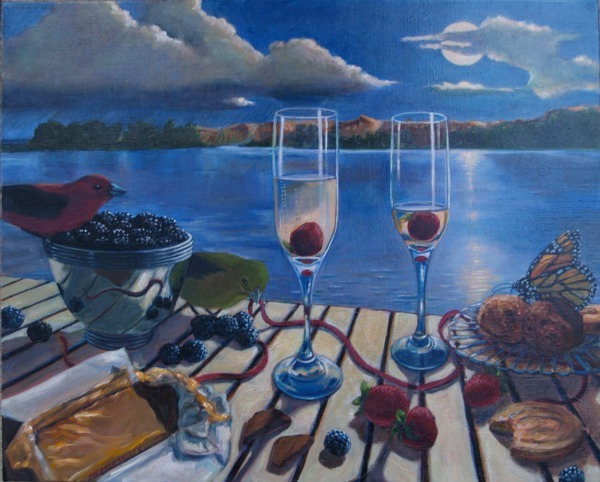 I’d especially like to thank: Mary Jo Ragar, Graphic Designer Laura Marshall, the Heritage Seekers of Palmyra, the Gardner House Museum Director, Becky Taylor, and all of her hard working volunteers, the Palmyra Area Arts League, Mark Cheffey at the Palmyra Spectator, Marylou Montgomery at the Hannibal Courier Post and Rebecka Maas at the Quincy Herald-Whig. Today, Rob and I walked on the University of Kansas campus and came upon a Patrick Dougherty sapling sculpture commissioned by the Spencer Museum of Art. It’s an engaging and fantastic piece of work. The placement of the saplings gives the impression of a tornado surrounding a very calm tree. Further into the walk, swallows circled us in their crazy flight pattern as we walked around Potter’s Lake. While I was studying the birds I noticed Rob fooling with what I thought was a trash barrel. Not. It was a whirly-gig. Perhaps the inspiration was a Merry-Go-Round, but the fabric had come out of the pivot point making the whirly gig only partially operable.